Alexa enabled device, exciting way to control music and entertainment experiences in your home. With the MusicCast controller app, it can be used with multiple MusicCast Products at one time. The app features beautifully designed display, which allows you to customise your taste to fit the theme. With the SRT1500 Beam, you can adjust your sounds for detailed quality sounds throughout. 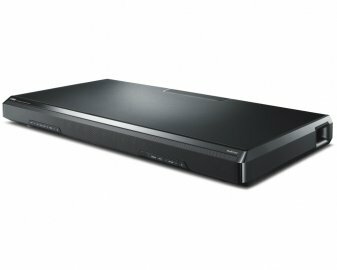 The Yamaha uses the Digital Sound Projector technology to produce the sound beams that reflect off walls of your room to give you true surround sound. With a immersive listening experience you can bring your shows to life. This speaker is built with exceptional sound quality, the beams that are produced for the sound of using a central array of eight beams and oval woofers on both sides of the device. With the dual built subwoofers that improve the bass ports, on the left and right sides of the bottom surface they come equipped with independent bass reflex ports which reduce unwanted sounds and smooth flow of sound.